That is because back wheel is deeply sunk in the mid because of weight and it crosses the other track and so the murderer is going away from village. If you think about it, this is where Sherlock Holmes is wrong. We hate to acknowledge that super smart Holmes is wrong but actually he is. While the back wheel will cross the front wheel but that will be true in either direction of bicycle is going. If holmes would have said there were two murderers going on unicycle it might be a better answer. So how can we help Holmes or Arthur Conan Doye here? So now let us investigate. And the answer to this is Elementary Watson. The back wheel follows the front wheel always. Unless of course you are driving the cycle backwards. Which you can’t unless you have a BMX cycle which will be invented in future (this story happened in 1904). And the length of bicycle is constant. So the murderer is going towards the village. OK let’s do the details. The back wheel cannot turn. So the back wheel and frame point towards the front wheel or center of front wheel. Direction of the wheel at any time is just the tangent to the path. So if we draw the tangent on the back wheel path it should cut the front wheel at a distance which is the length of cycle. 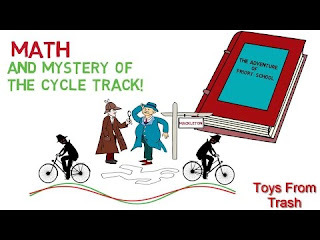 Now if we draw the tangent to green track here we see it does not cut the red track at cycle length. So green cannot be back wheel and is front wheel. While the tangent to red track cut the green track so it is back wheel. And now by drawing tangents at different locations we can see that in only one direction the distance is constant. So the cycle is going Left to right. So the murderer is Rueben Hayes living in the village. And now since we are all expert detectives. Is it possible to have a track where we cannot tell a direction? Well it is possible if you can ride a bicycle in a circle. The tracks will be two circles with same radius with back wheel with smaller radius. Since this is symmetric you cannot tell whether are going clockwise or anticlockwise. But since you are going in circles anyways it doesn’t matter unless of course you are a MATHEMETICIAN.